August 15, 2018 September 19, 2018 - by huma Iqbal - 3 Comments. Azra Naheed Medical College ANMC Open Admissions in doctor of physiotherapy, Doctor of Pharmacy, Doctor of Medical Lab Sciences, Doctor of Medical Imaging Technology, Doctor of Dietetics and Nutritional Sciences. Apply Admissions online through www.superior.edu.pk. Azra Naveed medical College Approved from PMDC and Pharmacy Council. 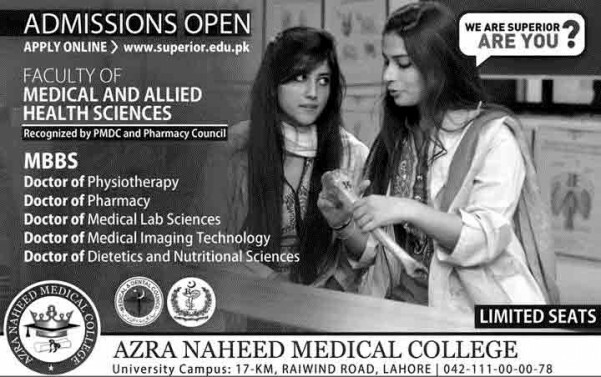 Azra Naheed Medical College 17-km Raiwind Road, Lahore projected by Superior Group of Colleges Lahore. Azra Naheed Medical College, established in 2011 and named after Azra Naheed, is a private college of medicine, pharmacy and allied health professions. plz tell the fee structure??? What is the fee structure 2017 of azra naheed medical college? did u know the fee structure? ?